The Tunnel View overlook is at the west end of Yosemite Valley, up Highway 41 towards the south entrance to the park. The main exposure for this 24 mm image was captured at 1/800th of a second at f/8, ISO 400. To capture the full dynamic range of the scene, three exposures were captured using Automatic Exposure Bracketing, adjusted in Adobe Lightroom, combined and converted to black and white in PhotomatixPro. 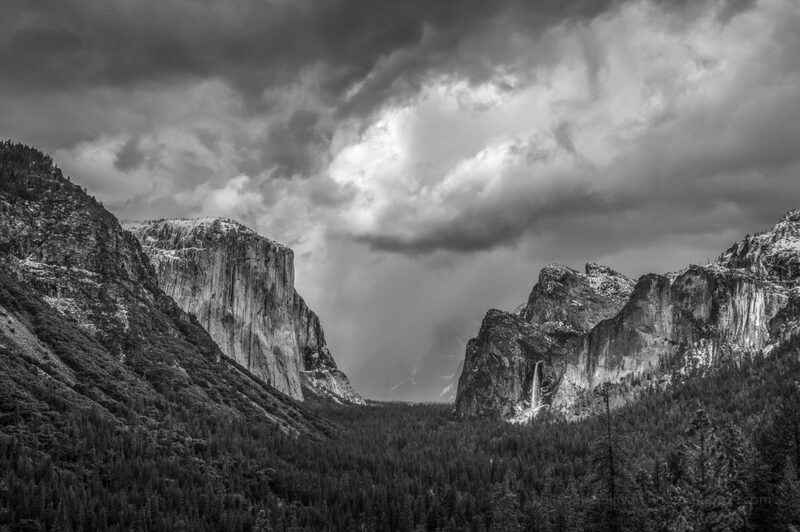 Although snow storms are not frequent in Yosemite Valley in April, they can occur well into May. So it was no surprise when this storm rolled through in early April, providing dramatic clouds and snow showers for visiting photographers.